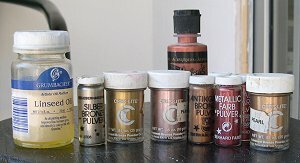 This free art tutorial will help you learn how to paint with metallic, or flaked paints that are actually ground from stones or metallic stones/metals, called 'pulvers. 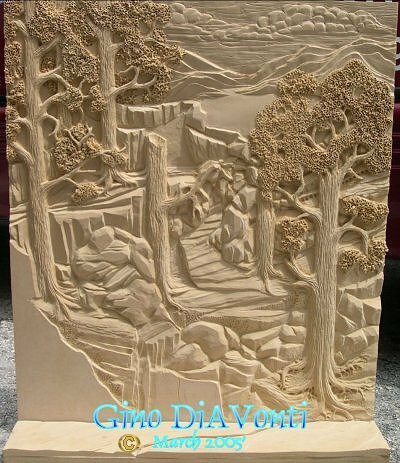 Gino has of late been working on a Commission for a Wood carving. This has allowed him to document the process of the finish. During the course of this page, you will be able to see and learn the process he will be using, so that you too can duplicate it on some of your own Works should you choose to. First, the Wood carving must be thoroughly cleaned and prepped out for the finish. To make sure that no dust gets into the liquid finishes, One must prepare their Studio. Sweep the floors, dust any tables and every area around the Wood carving in question. 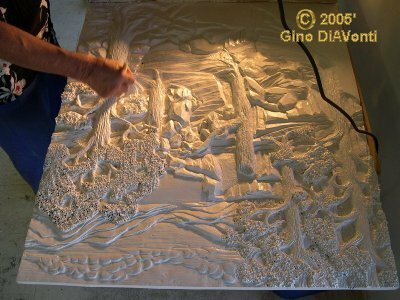 Gino takes a wet/dry vaccuum to the Wood carvings' surface to remove any dust that is trying to hide in undercuts. After you're sure that all the dust is removed from the room where the Work is being finished, use tackcloths on the Carving to remove any stubborn particles that may still linger. After you're sure it is cleaned and no dust remains, thinly add a wood sealer to the surface of the Carving. Allow to dry completely before adding the next coat. The carving shown only took one coat, but depending upon whether it is pneumatically sprayed, (or done with brush as is here) you may need another coat. The product Gino has used on this particular carving is called " Bullseye 1-2-3 Primer & Sealer ". It only comes in white, as far as I know, although it may be sold in other colors in other states. 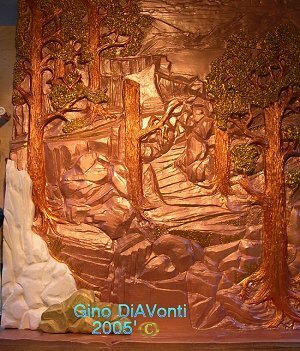 After it dried, Gino sprayed it several times with thin coats of pale copper. This gives the piece a base color and one he will now begin to paint over with the pulvers. Pulvers are ground pigment that are not yet suspended in any carrying medium. You can purchase them at larger Art Shops. After the copper thoroughly dries, One can begin adding the metal paints to the surface. You will need Linseed oil, metallic pulvers, various sized brushes, paper towels and some glass bowls with lids (or you can cover with glad-wrap) and Paint thinner. Remember, because you will be suspending the pulvers in linseed oil, you have now created an oil−based paint, so drying time rises considerably. You will need to protect the Work from airborne dust for that period. Gino used one acrylic copper paint on the Work (Its the tall one in the background of picture to your above-right) If you mix acrylics with oils, be sure to lay down the Acrylic First, then the oils, as acrylics cannot be painted OVER oils! The tree trunks were done in the acrylic copper. 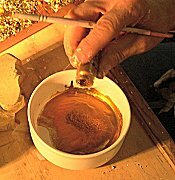 Then he used gold as the first base coat on the leaves, and went over most of it with the gold-bronze, leaving only highlights of the original gold. He also used the gold-bronze to highlight the rocks. The boulders that are a part of the intact piece have been painted first in a thin wash of silver, and highlighted with pulvers suspended in diamond clear resin.. The horses are painted first with gold, then the addition of thin resin. Make sure the Work is entirely dry before adding the top-finish! When you're sure its dry, tackcloth it one more time and spray the entire piece with either a matte or gloss finish, to seal the Work. Use a mask when spraying the finish, it stinks and is unhealthy to breathe, but sure does make for an impressive completion! Gino later added the oil colors pthalo green, grumbacher red, cadmium-barium yellow and blue metallic Farb pulver. With these, he painted in the ferns and grasses he'd carved in, and added tiny red & yellow flowers. He also painted the lake.